I woke up this morning and was surprised with what I saw on the table. 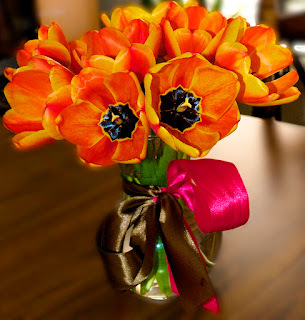 A dozen tulips from our garden put together by our daughter, Rachel, and my hubby. It sure made my day seeing them on the dining room table. We had a lot of tulips blooming in our front yard and Rachel really loves them. They got up early and saw a dozen blooming, so they decided to cut them and put them in the flower vase. They look really nice and I love to stare at them. Flowers are really expensive and having them in your own front or backyard really saves a lot of money if you like flowers like I do. Even though I love them, I don’t really like planting and watering in a garden, although lately I started planting because Rachel likes it. I took a couple of pictures of them because they all were blooming so good. Rachel put some decorations on the flower vase and she was so happy that I liked it.